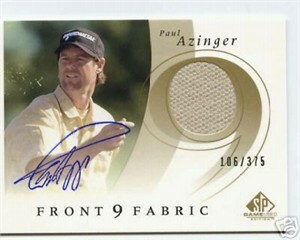 2002 SP Game Used Front 9 Fabrics Paul Azinger certified autograph card with a swatch of tournament worn shirt. Numbered #106/375 on the front. ONLY ONE AVAILABLE FOR SALE.